As a parent, you play an essential role in your teen’s success. There are intentional ways to grow a healthy parent-teen relationship, and growing your teen’s skills to manage anger provides a perfect opportunity. Teens and emerging young adults ages 15-19 are still in the process of learning about their strong and changing feelings. They do not fully understand the physical and mental take over that can occur when angry. While striving for more independence, the sense of a lack of control that anger can produce can frighten them adding to the length and intensity of their upset. It might also humiliate them if they are mad in front of respected others like teachers, siblings, friends, or relatives. Teens may feel social pains more acutely because of the increasing importance of the roles of peers in their life. Learning how to deal with anger without suppressing it, beating it down, or expressing it by hurting others and/or themselves is critical. And, your support and guidance as parents matters greatly. Research confirms that when teens learn to manage their emotions, it simultaneously strengthens their executive functions.1 They are better able to use self-control, problem solve, and focus their attention. This directly impacts their school success. However, the opposite is also true. Those teens who do not learn to manage their emotions through the guidance and support of caring adults have attention issues and difficulty in problem solving. Yet, we all face challenges in managing anger. Your teen may slam the bedroom door as they refuse to tell you what is happening and why they are so upset. Anger may cover hurt, humiliation, fear, and stress. It may also mask guilt, shame, grief, or envy. Or, it could be the tip of an iceberg with a mass below of frustration. The key to many parenting challenges, like managing anger, is finding ways to communicate so that both your needs and your teen’s needs are met. The steps below include specific, practical strategies along with effective conversation starters to prepare you to help your teen work through their roughest, most intense emotional times in ways that grow their resilience. Whether it’s your fifteen-year-old melting down in frustration over trying to get math homework accomplished or your nineteen-year-old yelling after not being allowed to go to an unsupervised party, anger and its many accompanying emotions can become a regular challenge if you don’t help your teen create plans and strategies for dealing with and expressing anger. This five-step process helps you and your teen manage anger. It also builds important skills in your teen. The same process can be used to address other parenting issues as well (learn more about the process). Use your best listening skills! Remember, what makes a parent angry can differ greatly from what angers a teen. Listen closely to what is most concerning to your teen without projecting your own thoughts, concerns, and feelings. What makes a parent angry can differ greatly from what angers a teen. Listen closely to what is most concerning to them without projecting your own thoughts, concerns, and feelings. Fifteen-year-olds are in the final year of the major physical changes that occur in puberty. They may feel a bit insecure and sensitive to criticism. They may be preoccupied with peer interactions and impressions. Homework and academic goals are less important than socializing but still important. Teens may fear failure in front of you, in front of their teacher, or their peers and may seek to avoid certain projects or tasks to avoid that feeling of humiliation. Though peers are highly influential, teens at this age still look to you for encouragement that they can handle the bigger expectations and work load. The peer group can present all sorts of emotional challenges including worries about who’s in the “in” and “out” crowd, to whom your teen is attracted, and to whom your teen desires to build friendships. Strong friendships can serve as a key support and also help motivate your teen to work hard in school, so your coaching and support of their connections with friends can also make a difference in their sense of wellbeing. Sixteen-year-olds are at the end of the awkwardness of their new physical being and are beginning to feel and appear more confident in themselves and who they are. They may have new important goals outside of school, and along with them they may experience stress and worries related to learning to drive, getting a driver’s license, getting a new part-time job, or trying out a romantic partnership. All these are critical steps for their exploration of adult life. This age group might be tempted to stay up late studying or socializing, but that lack of sleep challenges their self-control and ability to manage anger and anxiety in healthy ways. So, your role can be most effective keeping an open, non-judgmental dialogue about their social, academic, and life goals and how they can manage the normal stress and uncertainty that goes along with it. Seventeen-year-olds have more serious pursuits on their mind and may become highly focused on their academic and life goals as they consider the fact that their graduation is coming up, and they’ll need to face life after high school. At times, they may seem to feel invincible and, perhaps, overly confident while at other times, they might resort to behaviors from earlier years, seeming fragile and scared. It can become a highly stressful time, so your support during this time is critical. They’ll require multiple options for dealing with stress in healthy ways, and this may represent your last year for practicing together while still under your roof. If your teen is going to college, applying and preparing for that major transition will create stress. Also, it’s common for teens to unconsciously create reasons to get angry with parents as they attempt to make the physical separation of leaving home easier. Eighteen and nineteen-year-olds are now considered emerging adults gaining the ability to vote and are socially recognized as adults. Many will be entering college with a brand new set of academic goals and expectations. Also, they may be facing living on their own for the first time. For this reason, they may be eager to discuss the complexities of adult responsibilities. Most of all, they’ll need your listening and reflecting back. At times, they may exude confidence while at other times, they may feel highly insecure and run to you needing comfort and security. This is a time for redefining your relationship so paying close attention to their needs, offering your assurance that they are ready and can do it on their own, and allowing for their independence are some of your most important roles. Understand your mind when angry. 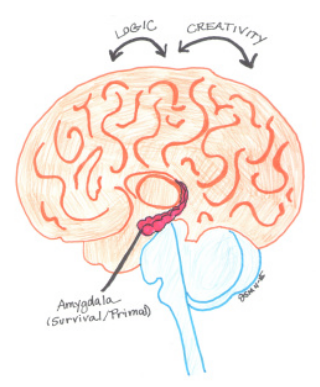 Anytime you are emotionally shaken from fear, anxiety, anger, or hurt, you are functioning from the part of your brain that developed first – the primal brain – or amygdala. During these intense feelings, there is a chemical that washes over the rest of your brain that cuts off access so that your only functioning abilities are in your survival center. This “hijacking” of your brain, as Daniel Goleman author of Emotional Intelligence refers to it, serves a critical role.3 In true survival circumstances, you are able to focus on fighting, fleeing, or freezing. If you are being hunted by a tiger, your mind focuses immediately on running away. Your body surges with hormones, such as adrenaline, that give you an extra boost of energy. A high level of anger can quite literally paralyze thinking. Effective problem solving requires logic, language, and creativity though none can be well utilized when greatly upset. But, in family life, fighting with words or actions or fleeing out the door is often not constructive, safe, or practical. Creating a plan (as you will be guided to do in the tool that follows) for what each member can do when they are in this state of mind and practicing it can prepare all members to act with emotional intelligence during a crisis, big or small. Anger is not bad or negative. We should not avoid or shut down the experience of it. There’s good reason for it. We have all experienced someone in our lives who has lost control and acted in ways that harmed themself or others when angry. However, we know that every emotion, including anger, serves a critical purpose. Anger provides essential information about who we are, what emotional or physical needs are not getting met, and where our boundaries lie. Venting, such as complaining, ranting, or even mumbling, does not get out the upset thoughts and feelings. In fact, venting is to anger as rumination is to worry. We can churn through worrying thoughts in our minds repeatedly, but those thoughts go nowhere and ultimately are unproductive. So too venting, whether we are listing off our complaints to another or talking to ourselves, tends to reinforce our negative thinking. That’s because it does not offer an alternative view of the situation nor does it pose any solutions. Because venting doesn’t change thinking, the feeling persists. Deep breathing is not just a nice thing to do. It actually removes the chemical that has flowed over your brain so that you regain access to your creativity, language, and logic versus staying stuck in your primal brain. Practicing deep breathing with your teen can offer them a powerful tool to use anytime and anywhere they feel overcome with heated emotions. Model behaviors (and your teen will notice and learn! ).4 Here are some ways that you can deal with your own upset or anger. Recognize your anger. This self-awareness can come from a number of cues. Take note of physical symptoms when they happen. It can cue you into the need to calm down before choosing your next words or actions. Notice the signs, discuss what signs your teen notices, and take the following steps. Breathe first. Slowing down your breathing serves a critical biological function. It allows those chemicals that have surged from your anger to recede. Your body is able to regain its composure. And, your brain is able to think beyond fight, flight, or freeze. Practice deep breathing audibly. Try breathing deeply through your nose while constricting your throat slightly producing a sound like the waves of the sea. Not only will the sound help calm you, but it will also emphasize and call attention to your breath for your teen to observe. Work on your family feelings vocabulary. Yes, at times, parents have to become a feelings detective. If our teen shuts down and refuses to tell us what’s going on, we have to dig for clues. In fact, it’s necessary to be able to identify our emotions to become more self-aware and successfully manage our emotions. When you are reflecting on your teen’s feelings, you can think about unpacking a suitcase. Frequently, there are layers of emotions that need to be examined and understood versus just one. Anger might just be the top layer. So, after you’ve discovered why your teen was angry, you might ask about other layers. Was there hurt or a sense of rejection involved? Perhaps your teen feels embarrassed? Fully unpacking the suitcase of emotions will help your teen feel better understood by you as they becomes more self-aware. Create a chill zone. During time without pressures, design a “chill zone” or place where your teen decides they would like to go to when upset to feel better. Teach your teen how to stop rumination. If you catch your teen uttering the same upsetting story more than once, then your teen’s mind has hopped onto the hamster wheel of rumination. In these times, it can be difficult to let go. Talk to your teen about the fact that reviewing the same concerns over and again will not help them resolve the issue, but talking about them, calming down, and learning more might help. Setting a positive goal for change will help. Discuss what they can do when they are thinking through the same upsetting thoughts. “What needs is my teen not getting met?” Their needs can be emotional needs like needing a friend to listen or give them attention, needing some alone time, or needing to escape a chaotic environment. Help your teen to repair harm when needed. A critical step in teaching your teen about managing anger is learning how to repair harm when they’ve caused it. Mistakes are a critical aspect of their social learning. We all have our moments when we hurt another. But it’s that next step that they take that matters in repairing the relationship. Allow your teen to supply answers, and you may be surprised at how many options they come up with. Support and guide them to follow through on selecting one and doing it. If you are helping your teen use this in communicating with a friend who has angered them, here’s how it might be used: “I feel angry when you pick all of our friends for your team but me, because I was counting on playing with everyone. Now, I am on a team with others I don’t know.” Practice the wording together with your teen’s specific issue. If you tell or even command your teen to make an apology, how will they ever learn to genuinely apologize with feeling? In fact, apologizing or making things right should never be assigned as a punishment since then the control lies with the adult and robs the teen of the opportunity to learn the skill and internalize the value of repairing harm. Instead, ask your teen how they feel they should make up for the hurt they’ve caused and help them implement their idea. Practice can take the form of cooperatively completing the task together or trying out a skill with you as a coach and ready support. Practice is not only nice, it’s necessary in order for teens to internalize new skills. Practice makes vital new brain connections that strengthen each time your teen performs the new action. Use “I’d love to see…” statements. When a teen learns a new ability, they are eager to show it off! Give them that chance. Say: “I’d love to see you use your chill zone to find your feet again.” This can be used when you observe their upset mounting. Hot chocolate breathing. Pretend to hold your hot cup of cocoa in both hands in front of you. Breathe in deeply the aroma of the chocolate. And then blow out to cool it in preparation for drinking. Do this to the count of five to give your teen practice. Then, look for chances to practice it regularly. Include reflection on the day in your bedtime routine. Begin by asking about worries or problems that your teen will surely consider after you leave the room. Listen and offer comfort. Demonstrate that you are allowing and accepting of the uncertainty of unresolved problems. You could say, “There’s no amount of worrying that is going to fix things tonight. So, how can you talk about accepting what you have and where you are now and working on it tomorrow?” Then, turn to gratitude. Teens may not have the chance to reflect on what’s good and abundant in their lives throughout the day, yet grateful thoughts can be a central contributor to happiness and wellbeing. And, grateful thoughts directly wipe out ruminations. Follow through on repairing harm. When your teen has caused harm, it’s easier to shrink away in shame and attempt to escape the problem hoping time will heal all wounds. But if real damage has been done – emotionally or physically – then your teen needs to take some steps to help heal that wound. It takes tremendous courage, however, to do so. So, in order for your teen to learn that a next choice can be their best choice and that they can make up for the harm they’ve caused, they need your guidance, encouragement, and support in following through on those steps. They are learning the invaluable skill of responsible decision making. At this point, you’ve taught your teen some new strategies for managing anger so that they understand how to take action. You’ve practiced together. Now, you can offer support when it’s needed. Parents naturally offer support as they see their son or daughter fumble with a situation in which they need help. This is no different. Learn about development. Each new age and stage will present differing challenges and along with them, stress, frustrations, and anger. So becoming informed regularly about what developmental milestones your teen is working toward will offer you empathy and patience. Build in celebrations like game night, watching movies or shows together, or a favorite dinner. Include hugs, high fives, and fist bumps in your repertoire of ways to appreciate one another. Lerner, H. (2014). The dance of anger; A woman’s guide to changing the patterns of intimate relationships. NY, NY: Harper and Row. Recommended Citation: Center for Health and Safety Culture. (2019). Anger. Ages 15-19. Retrieved from https://www.ParentingMontana.org.